Minox MobiDV has been introduced by Minox. The multimedia bundle fits into a shirt pocket! A digital video camcorder, a digital camera, a MP3 player and a dictating device, all combined in a flat slimline body of just 16mm and weighing a featherweight 87 grams including storage card and battery - a device boasting these key data is absolutely unique, just like the famous Minox spy camera was. 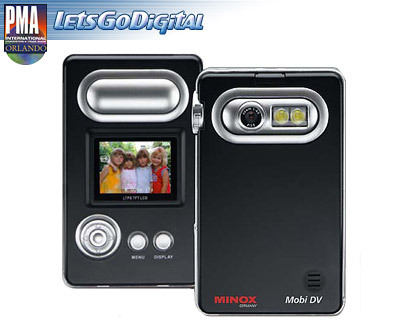 This small and powerful Minox MobiDV is a true multimedia bundle in shirt pocket format. Real innovations cannot be described in one sentence. The SD card camcorder MobiDV is no exception here with its ultimate technical features enhanced by an unusual design. The central feature is the flat and compact body which provides a pleasant, ergonomic handling of the camcorder, enabling a shake-free and easy one-hand operation, in combination with the lens that can be turned through 230 degrees. The shutter release arranged on the side is encompassed in a dial with which the camera lens can be pivoted about the horizontal axis to film or portrait the user as well, while he or she put themselves in the picture using the high quality 1.5 inch TFT display. In the area of the body the optics can be turned and "parked" to provide protection against dust and scratching. A chip with the resolution of up to 4 megapixels provides the required detail rendition, in poor light conditions a powerful LED spotlight offers assistance for illuminating film recordings or serves as a flash while shooting pictures. The MobiDV is powered by the Li-ion battery (corresponds to the NOKIA 7210 cell phone battery), which can even be charged via the USB data cable on a notebook, for example. Data storage is via the SD/MMC card which has a capacity of up to 1 GB - if that is not enough those requiring more can conceal a spare card in the body of the MobiDV. And if there is no subject available for photographing or filming, MobiDV can play up to two hours of MP3 music or make sound recordings on one battery charge. Besides the Li-Ion battery the scope of delivery of the Minox MobiDV includes a 128 MB SD storage card, an ever-ready case and earphones.